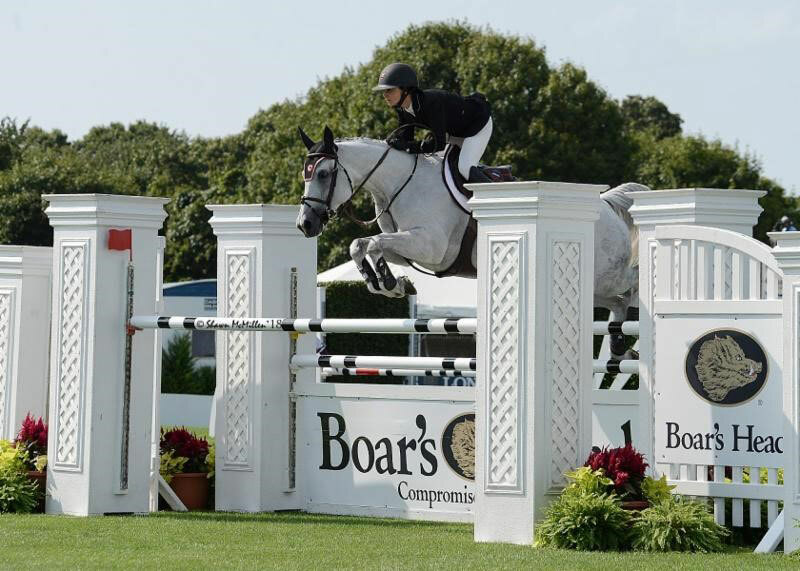 Georgina Bloomberg had just one goal for Paola 233 at this year’s Hampton Classic – to win the Opening Day grand prix, the $30,000 Boar’s Head Jumper Challenge. They achieved their goal with a flourish, besting a diverse field of 42 starters to take the winner’s purse of $9,000. Bloomberg, a native of New York, NY, explained that the ‘decisive moment’ in their jump-off round came as Paola landed from fence six and literally pivoted on one foot to the left toward the final combination without having to add any extra steps to complete the turn. “She’s a really quick horse – she’s quick in the air but she also turns on a dime,” said Bloomberg following the victory gallop. “And she’s brave. Sometimes I can go TOO quick with her and then end up missing it entirely! I trust her to go to anything – she can win anything she wants, it’s just a matter of me not getting in her way. Runner-up went to Canadian veteran Olympic rider Mario Deslauriers, with his 11-year-old mare Cherrypop, owned by Wishing Well Farm LLC of Sands Point, NY. Deslauriers, who went immediately following Bloomberg in both the first round and the jump-off, was faster across the ground but didn’t have the turning agility to best Bloomberg in the jump-off. Both riders have busy weeks ahead of them at the Classic – Deslauriers will ride Cherry in a few smaller classes while he has three in next week’s FEI division. Bloomberg has another major goal ahead with tomorrow, Monday, August 27 being Animal Adoption Day at the Hampton Classic, an event of which she is a long-time patron and sponsor.